North Woods Farm Fiber Company was a family owned farm and business operated by Teri and Larry Gabric. We were located in Inman, South Carolina, just north of Greenville/Spartanburg in the beautiful foothills of the Blue Ridge Mountains.North Woods had the reputation of producing quality livestock. 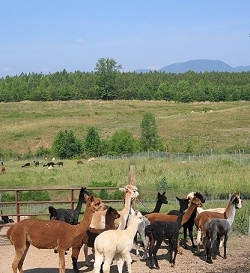 We had been raising Alpacas since 1991 and generally had a nice selection of Alpacas at fair prices. Two years ago we sold the property and moved to Florida. Teri is an accomplished dyer and has been expanding the availability of her hand dyed yarns.